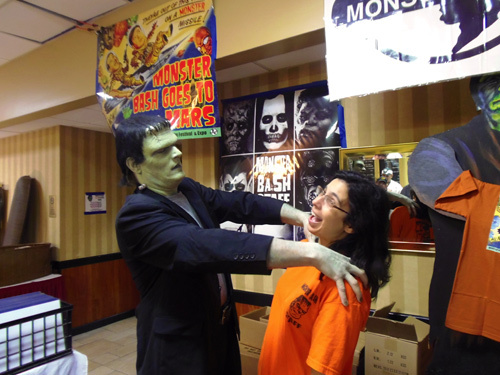 The Monster Bash 2012 featured Guests of Honor Martine Beswicke, Richard Kiel, Arch Hall Jr., Bert I. Gordon, Jimmy Hunt, Tom Savini, John Russo, George Kosana, Kyra Schon, Cortlandt Hull, Chilly Billy Cardille, David "The Rock Nelson," Son of Ghoul, Count Gor De Vol, Mr. Lobo, Penny Dreadful, Paul Speidel and many others! Photos provided by Sandy Castle, Mark Mawston, Joey Vento, Bob Swaney, Barb Heiss, Tom and Eileen Jackson, Arch Hall Jr., Malcolm Gittins, Evan Kendal, Brian Kegan, Ted Lewczyk, John Sargent, Charles Henson, David Nelson, Theron Statler, Michael Joyner, Karl Spisak and others - thank you! 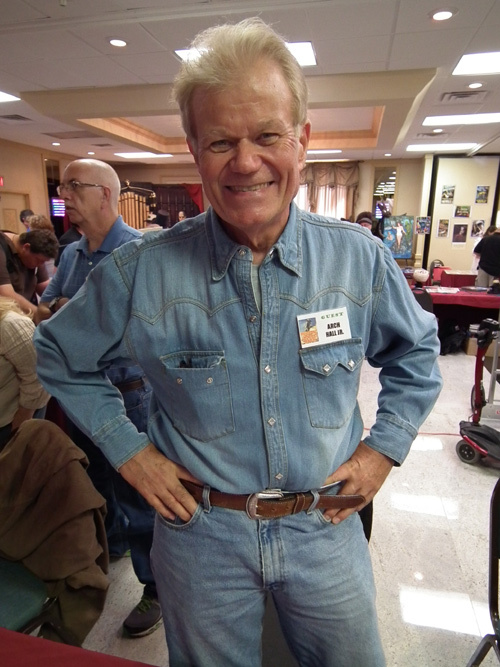 Mark Mawston snapped this very cool and unusual photo of Arch Hall Jr! Cortlandt Hull holds his Great Uncle's head! 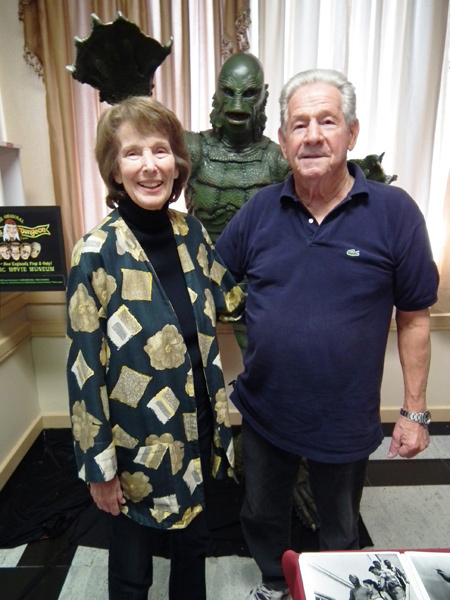 It's the replica had of Henry Hull as the WEREWOLF OF LONDON. Photo by Mark Mawston. 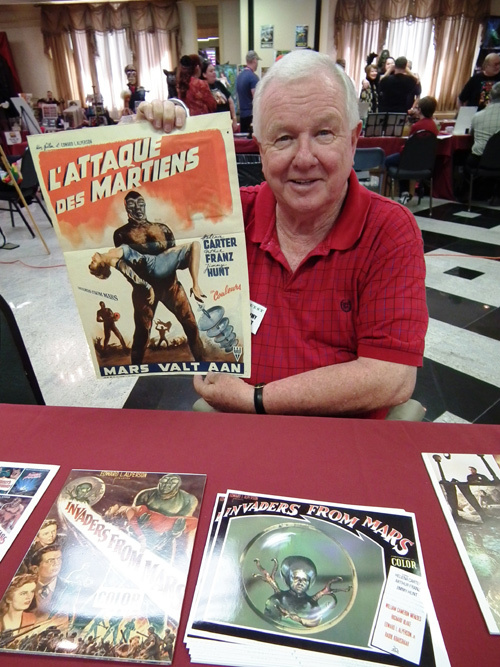 A wonderfully telling photo of how nice a man Jimmy Hunt is, by Mark Mawston. 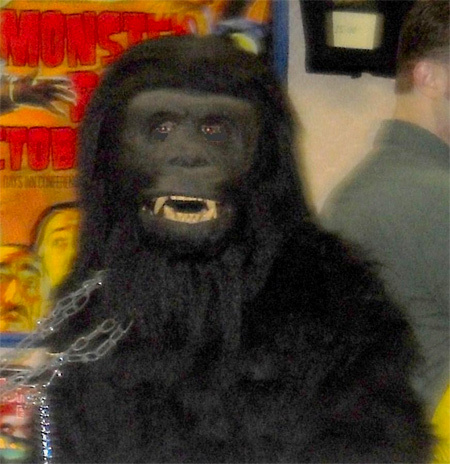 Joey Vento as a Bashin' ape smiles for the camera. Jess and pal get ready to head into the crowds at Bash to give away dozens and dozens of bananas! 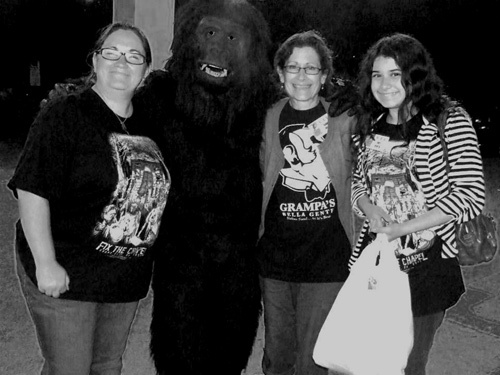 Gorillas night out at Monster Bash. A clash of the not-so-titans! 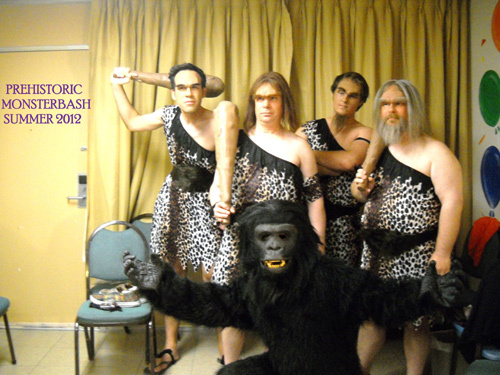 Creatures run amok at Bash! 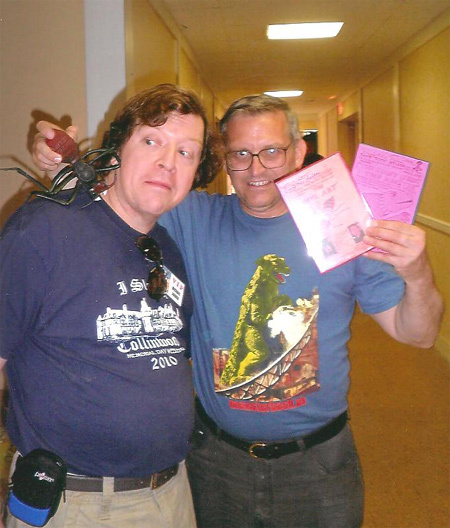 Michael Joyner submitted this photo of his encounter this year with the unstoppable monster movie promotor - David Nelson! 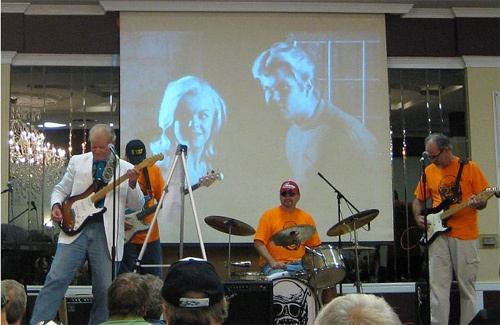 Arch Hall Jr. puts the pedal to the metal in a rockin' jam session with The Bash Boys! 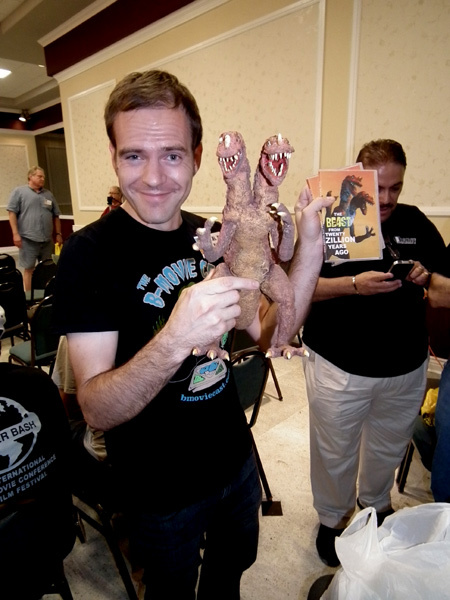 Following in the dinosaur footsteps of heroes like Ray Harryhausen it's Ryan Lengyel with his "Beast" that he animated with stop-motion in THE BEAST FROM TWENTY ZILLION YEARS AGO short film! Photo by Mark Mawston. 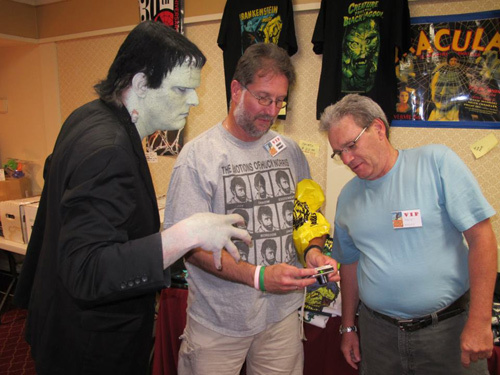 The monster has to check his own picture out along with his new friends! 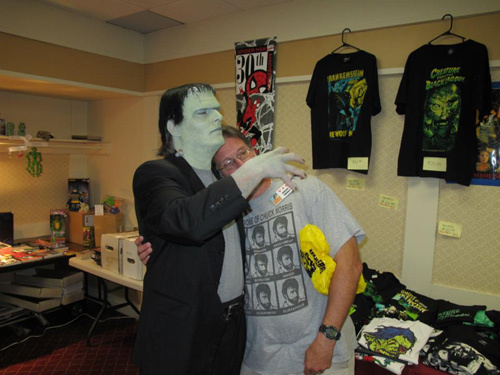 Attendee, Bob Swaney, gets a monster hug and gets out without a broken neck. Who let the dawgs out?! 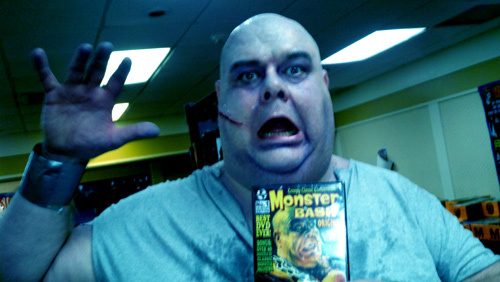 It's Joe Cole Jr. as MONSTER ON THE CAMPUS at Bash. Make-up by Jesse and the ReelMagik Team! 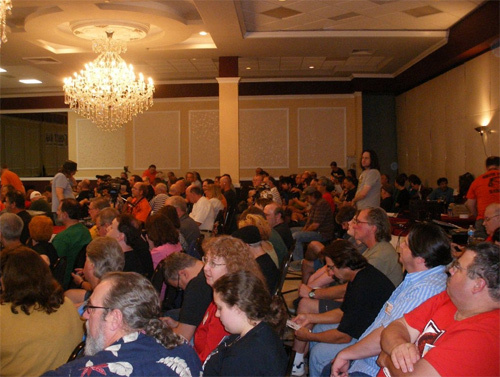 The Bashers await the next event! A lonely life for one monster, shunned by all. 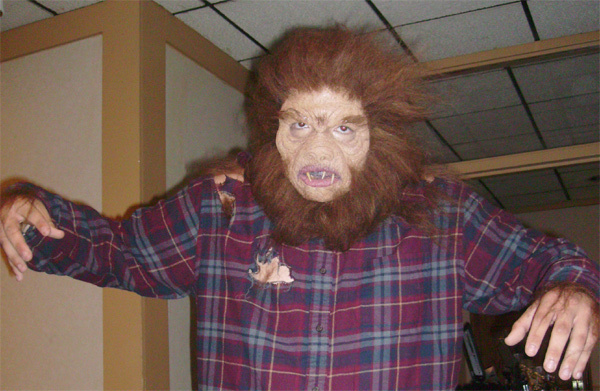 Todd Spidle as the monster, make-up by Jesse Melchior and the ReelMagik team. 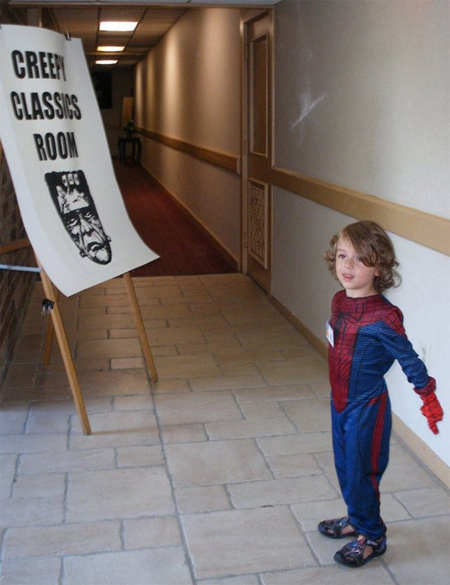 Luckily Spider-Man was around to hold off the monsters at key points of entry. Some know him as Peter Parker, we know him as Korbin, monster-fighter! I see you! 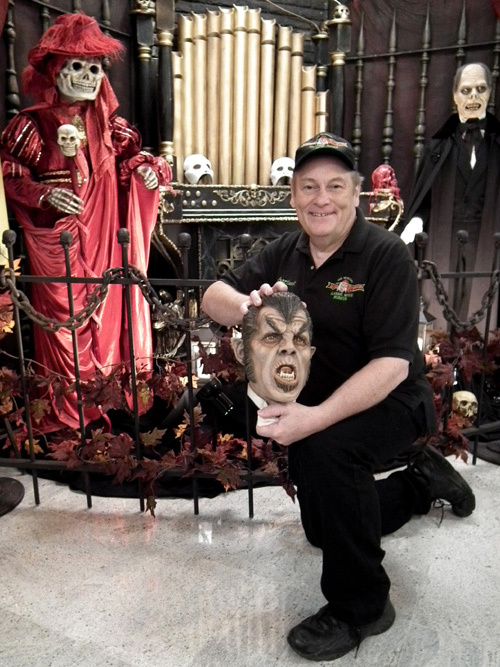 At Monster Bash! Drama at Bash! 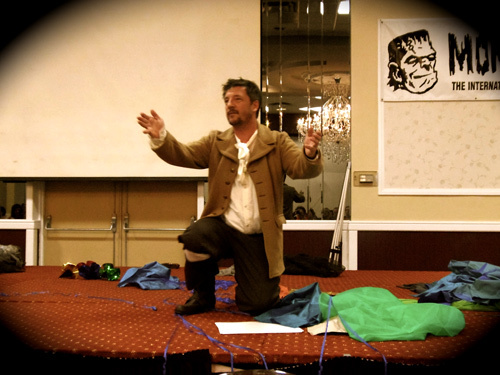 It's Zach Zito doing a one-man show based, in part, on THE LOST WORLD by Sir Arthur Conan Doyle! 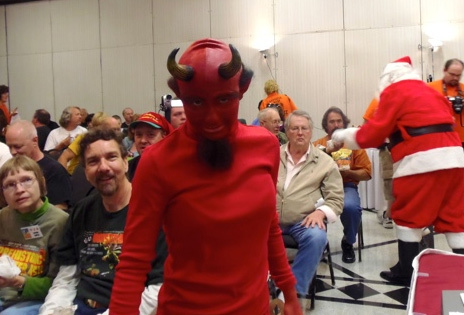 Reliving the Mexican Santa Claus movie with Paisley Adams as "Pitch!" 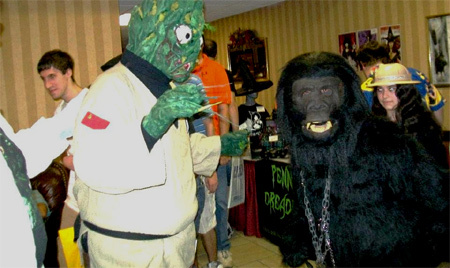 FRANKENSTEIN MEETS THE WOLF MAN? 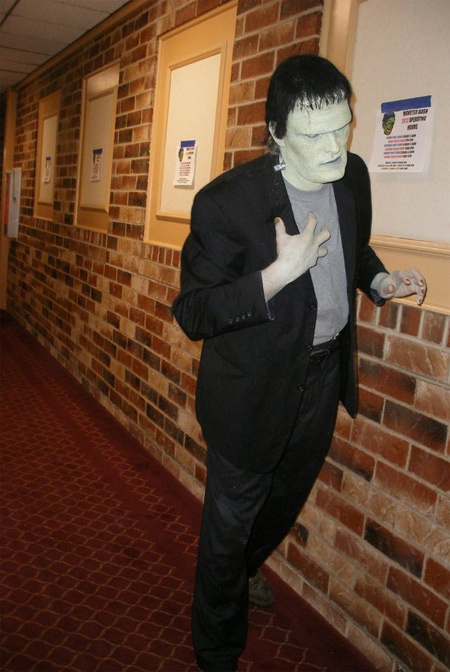 Nooooo, it's FRANKENSTEIN MEETS URSULA ADAMS at Monster Bash. 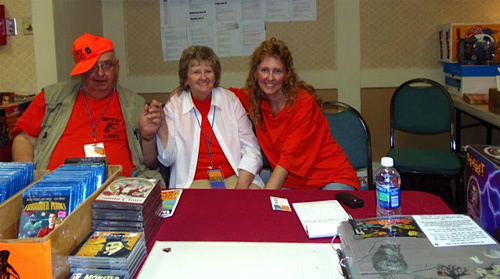 "Big Daddy" Adams (the serious one), Jan Adams and Tami Adams at Creepy Classics Central at Monster Bash 2012. 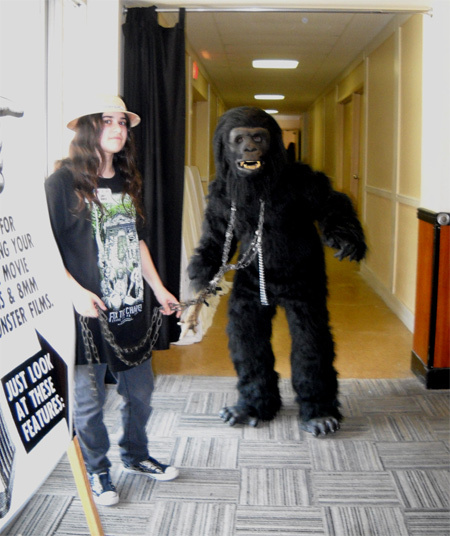 Lobo (Kevin Rice) is happy to be home at the Creepy Classics Room during MONSTER BASH. Catching up on reading about vampires, what else? 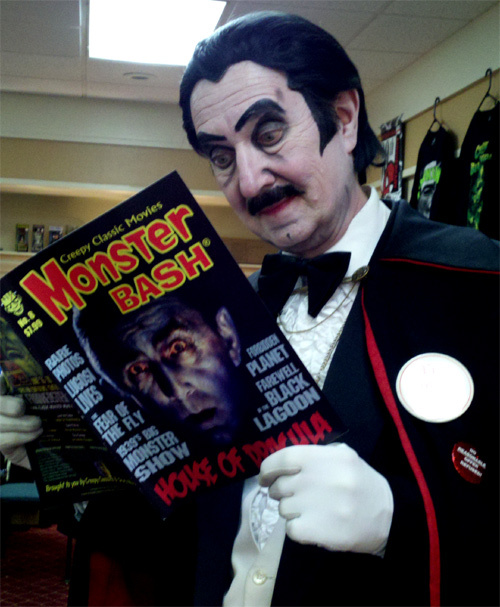 At MONSTER BASH - it's Count Gore De Vol, horror host legend. 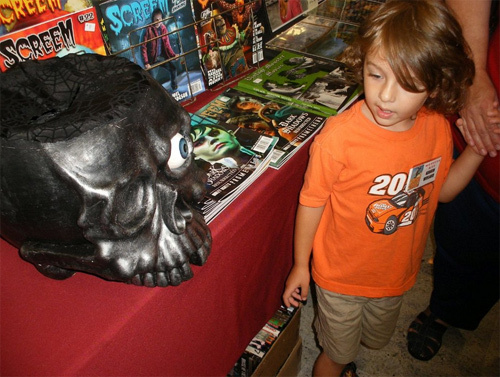 More Photos from Monster Bash 2012 - CLICK HERE!